At Norman Pannell, our first priority - above and beyond academic performance - is the wellbeing and safety of every child. We spend a great deal of time and care getting to know each child, giving them somebody to talk to and trust. Our aim is to ensure that every child feels loved, special and understood. ‘The school ensures children learn in a safe, caring and enriching environment. Children are taught how to keep themselves safe, to develop positive and healthy relationships, how to avoid situations where they might be at risk including by being exploited. The school also has a statutory responsibility to share any concerns it might have about a child in need of protection with other agencies and in particular police, health and children’s services. Schools are not able to investigate child protection concerns but have a legal duty to refer them. In most instances the school will be able to inform the parents/carer of its need to make a referral. However, sometimes the school is advised by children’s services or police that the parent/carer cannot be informed whilst they investigate the matter or make enquires. We understand the anxiety parents/carers understandably feel when they are not told about any concerns from the outset. The school follows legislation that aims to act in the interests of the child. Ensure that you know what online activity your child is enaging in: social media, mobile phones apps, emails/twitter and online gaming. This is the starting point to being able to monitor your child's online activity. Encourage your child to use online devices in an open place in the house e.g. downstairs, rather than being isolated in their bedroom with the door closed. Ensure that your child understands what information is personal: i.e. email address, mobile number, school name, sports clubs, arrangements with friends, pictures or videos of themselves , their family or friends. Remind your child NEVER to share passwords to accounts, as this is often the cause of cyber-bullying and/or hacked accounts. If your child uses social media e.g. Facebook, Instagram, Oovoo, help them to check their security settings and ensure you are happy with their usage. Make sure that your children only upload photographs that they are happy for people to see, when uploaded these could be used by others. Remind your child never to respond to spam or junk mail or texts or click on any pop ups that appear whilst they are online. Help your child to understand that some people lie online and are not who they say they are. This is why it is important to only talk to people you know! If a stranger tries to speak to them online they must inform an adult. Always keep communication open for a child to know that it is never too late to tell someone if they see or receive something inappropriate. Please visit the websites below with your child. These will help you both understand the importance of staying safe online. Parent advice and activities for child safety online SWGfL have produced this collection of resources to help parents to understand the online world and keep their children safe. Already this year the children at Norman Pannell have been working on a variety projects on how to keep safe. 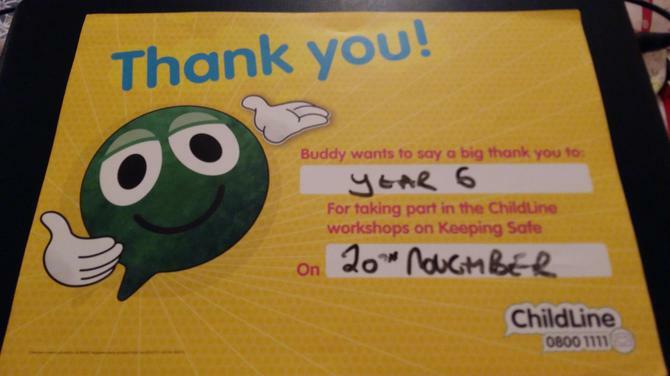 Congratulations to Year 6 who really helped Buddy work through a variety of scenarios during the days workshops!